Here’s part 10 of the ongoing serialization of Refactoring HTML , also available from Amazon and Safari. There really are standards for HTML, even if nobody follows them. One way to find out whether a site follows HTML standards is to run a page through a validation service. The results can be enlightening. They will provide you with specific details to fix, as well as a good idea of how much work you have ahead of you. 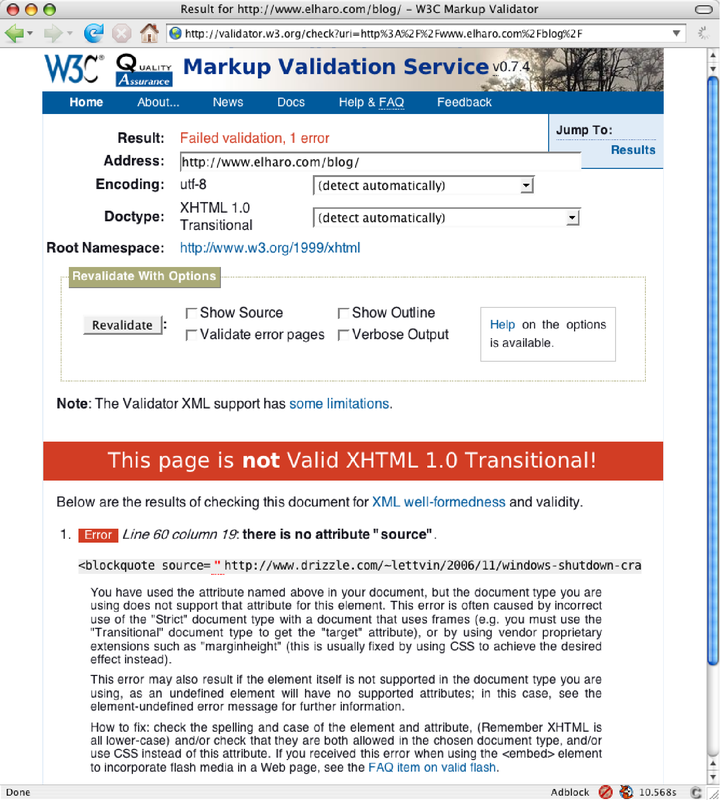 For public pages, the validator of choice is the W3C’s Markup Validation Service, at http://validator.w3.org/. Simply enter the URL of the page you wish to check, and see what it tells you. For example, Figure 2.1 shows the result of validating my blog against this service. It seems I had misremembered the syntax of the blockquote element. I had mistyped the cite attribute as the source attribute. This was actually better than I expected. I fixed that and rechecked, as shown in Figure 2.2. Now the page is valid. Here’s part 8 of the ongoing serialization of Refactoring HTML , also available from Amazon and Safari. We don’t have the time to waste on cleaning up the code. We have to get this feature implemented now! There are two possible responses to this comment. The first is that refactoring saves time in the long run. The second is that you have more time than you think you do. Both are true. Here’s part 7 of the ongoing serialization of Refactoring HTML , also available from Amazon and Safari.